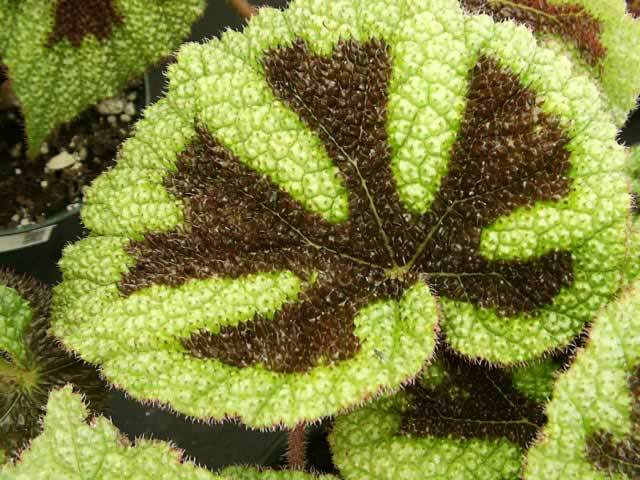 Iron Cross Begonias have some of the most unique foliage in the plant world. Each heavily textured, bristly, light green leaf bears a reddish-brown marking resembling the Iron Cross used on shields and flags during the Crusades of medieval times. but they are fairly insignificant and usually go unnoticed. that enjoy spending the summer in a shady part of the garden. Iron Cross Begonias are perennial, rhizomatous plants that grow from 8"-15" tall with 6" leaves. They are only hardy in USDA zones 11 and 12, so in most cases, they are grown as house plants. These Begonias grow best in bright indirect sunlight coming from a south, east or west window. Fluorescent grow lights are also an excellent alternative to natural light for these plants. When potting, set the plant with the crown slightly above the soil line. They should be planted in a porous, slightly acidic planting mix that contains some peat moss and leaf mold. African Violet potting mixes work well for Begonias. Using room temperature water, keep the soil evenly moist (never soggy) when the plants are actively growing, but allow the soil to dry slightly between waterings when growth slows. Keep water off of the foliage to help avoid powdery mildew and possible crown rot. Never allow your plant to stand in water. Feed actively growing plants every two weeks with a fertilizer formulated for house plants, applied at the recommended rates. especially during the winter months. 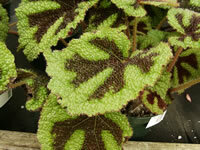 Begonia masoniana are susceptible to attacks from spider mites, mealy bugs and aphids. Outdoors provide your Iron Cross with protection from the wind. Keep them in partial shade. Do not let them dry out! Beware of slugs and snails! Always be sure to check for insects and pests before bringing your plants back indoors! 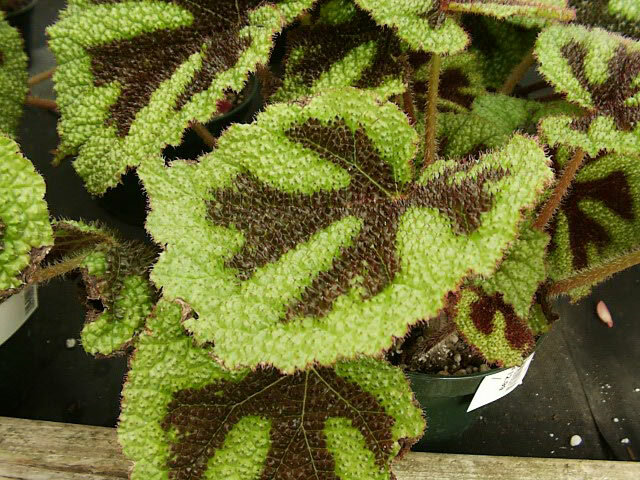 The easiest way of propagating new Iron Cross Begonias is with leaf cuttings struck in a mixture of moist peat moss and perlite. Water the soil well to be sure that it is settled and moist. Using a nail or small stick, make evenly spaced, slightly angled cutting holes at the same depth as the length of the stems. Select a good healthy leaf and remove it (with stem) from the plant by reaching in as close to the crown of the plant as possible, grasping the stem and gently twisting it until it pulls free. With a sharp, sterile knife, cut the stem at an slight angle (try to match the angle of the leaf), 1"-1½" inchs from the leaf. Insert your cutting into your rooting media deep enough that about ¼"-½" of the base of the leaf is covered by the soil mix. Gently press the soil around the cutting. Keep the rooting media moist, but not soggy. Place the tray in a warm (70°-75°), brightly lit area or under a grow light. The cuttings should begin to produce roots in about two weeks. You should have a new plantlet in about eight weeks!